The team gets ready for vegetation surveys. 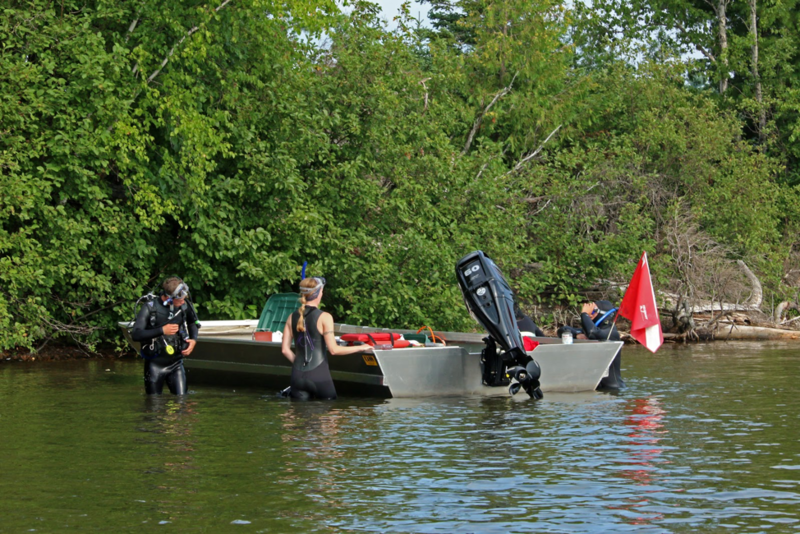 The North Temperate Lakes LTER vegetation survey team leapt out of their research boat, wetsuits and dive gear ready to go. The survey site bordered the opposite side of Trout Lake, a straight shot from the research facility and student dorms. Two bald eagles, native to this part of Northern Wisconsin, appeared disgruntled at our sudden presence, and screeched for a few minutes before soaring off across the lake. Divers – and snorkelers, for the shallow transects – pulled bright orange rings down with them beneath the waves and placed them on the lake bottom, encircling different aquatic plants. They then identified different species and estimated biomass, all recorded neatly on waterproof clipboards. Susan Knight, interim LTER manager and director of the Trout Lake Station, led the swimmers in hooking buoys to the transect anchor points, then sampled near the buoys. She was 63 the day I tagged along with the crew, but she has been diving since 22. They matched by accident! Two interns heading to the transect. I sat in another boat with Maddi Quamme and Natalie Schmer, both interns for the summer. We chatted while the team swam along the transects, their bubbles providing a musical backdrop to the morning. Maddi felt that she was always an outdoorsy kid, and for a while contemplated dropping out of school to become a chicken farmer. 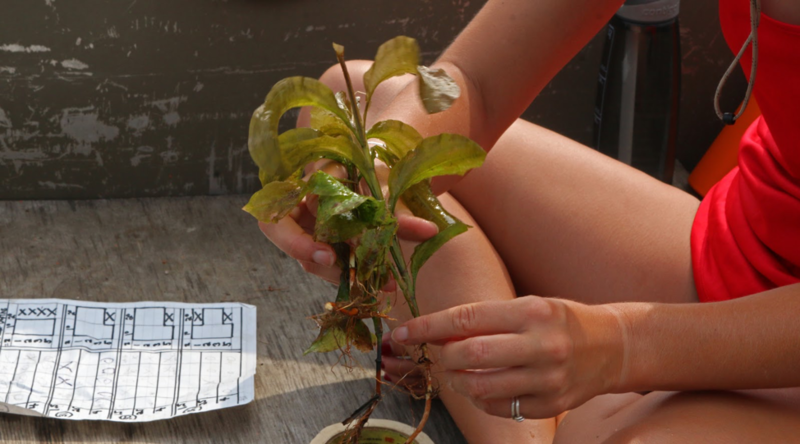 An environmental science class in college drove her in another direction, and she totally loved her summer work at the NTL LTER. College interns like Maddi and Natalie provide critical arms and brains to help with the intense summer field season, and they work on multiple projects throughout Wisconsin’s warmest months. Though their field experience was enriching, when I asked them what their favorite aspect of summer research was, they answered together: the people. The transects began in 1981, soon after NTL was designated as one of the very first LTER sites. Trout Lake includes four transects, sampled every August over two days. Since the mid-1990’s, the number of species of aquatic plants found has sharply declined, from a high of 26 to a low of 16 in 2003. Since then numbers have risen once more, hovering between 17 and 19. The team continues to monitor ongoing changes. Dr. Susan Knight gets ready to go beneath the surface. Dr. Knight and her divers had more transects to finish that day, and I motored back across the lake to give Maddi and Natalie a chance to return and help finish the monitoring. 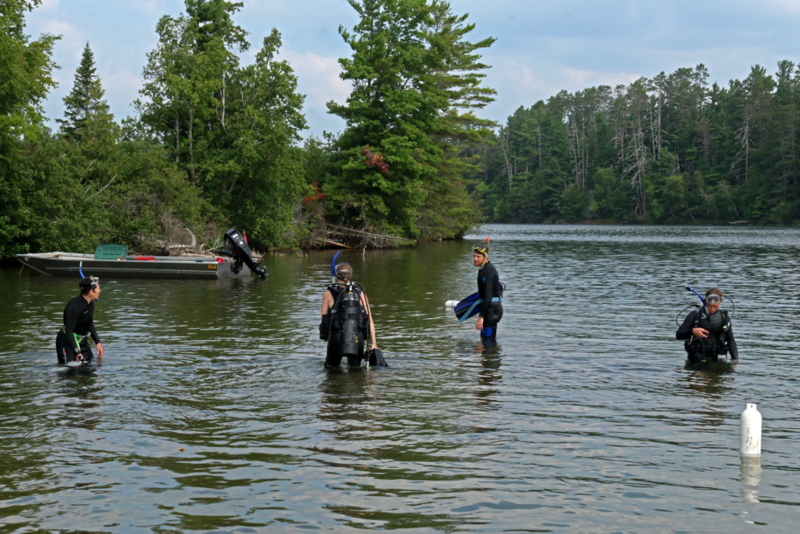 The taxing, physical work of diving has been critical to track the changes in plant biodiversity and biomass over time and what it could mean for this relatively undisturbed northern lake.